1 night’s accommodation for 2 people with breakfast: $260.00. Staying for 2 nights or more? We do a special rate of $185.00 per night. A 2-night stay for 2 people with breakfast: $370.00. Sound good? Call us on 09 4220521 | Mobile: 027 6025178 or email us about our multi-night special. If you wish to pay electronically or in cash upon arrival, we will confirm your booking by email and we ask for a 15% deposit. This is also refundable if you cancel 14 days or more before check-in. We charge a cancellation fee of 100% of total amount of the booking if you cancel with less than 14 days notification prior to check-in. If you cancel outside of 14 days, we will reimburse your booking minus any fees we are charged. Make a booking! Check-in at 3:00 pm and Check-out at 11 am. These times can be flexible, subject to room availability; we do try to fit in with flight and travel schedules. Where are we exactly? 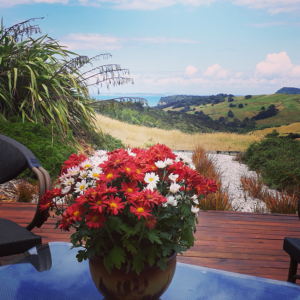 Our bed and breakfast is on Mahurangi West Road, about 2 kms north of Puhoi on State Highway One. We are halfway between Orewa and Warkworth. Find us on the map. See what our guests have said about their stay at Mahurangi West Wing.